The XP 310 was designed to be the medium assault rifle for 2000 & 2001. It filled that role pretty well. The blaster is in the chain including the XP 105, XP 110, XP 310, and the Max-D 6000. So fare, this is only rivaled by higher end CPS’s and Monster’s. 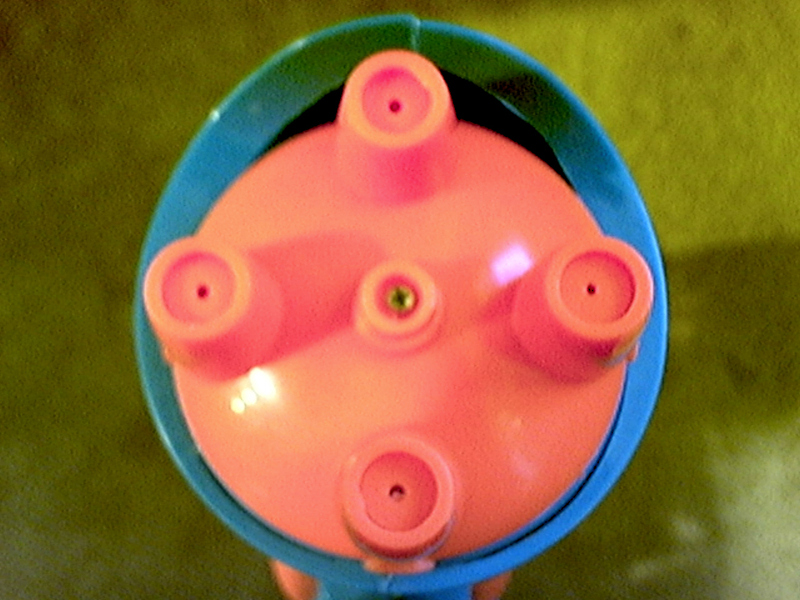 The blaster has four different nozzle selections including a 1X, 1.2X, 1.5X, and 2X. The 1X nozzle conserves water and increases firing time and is useful if you are low on water or are fighting smaller weapons such as Classics and side-arm class weapons. The 1.2X is more of an “I have a little more water left so I really don’t need to conserve as much” nozzle. It is also useful to get a small edge over smaller blasters. If you plan on riot blasting the XP 310, I suggest you do it on this nozzle. The 1.5X nozzle is the standard combat nozzle. Charge out into battle with this nozzle activated. The 2X is the all-out “You killed, err… eliminated my friend!” nozzle. The nozzles have very little drop-off when you re-select them. However, you might want to check the nozzle twice because it kind of feels like it’s not going to stay on there. The pressure chambers are both fairly large. The reservoir is transparent which is convenient for checking how much more you need to refill the tank and for knowing how much water you have left. The cap is tethered so you’re going to have to work at it to loose it. I fear the pressure gauge is off. But still glance at it occasionally because it does provide a rough reading of the contents of the pressure chamber. The blaster’s handle is comfortable and large enough. However, the pump handle is a bit too small. The XP 310’s colors aren’t the best one’s, but they are better than bright neon pink. One more thing to add onto the list of flaws in this blaster was that they forgot to add a strap! Overall, I think this is a great blaster and earns my 98%! This was my favorite soaker for a good 3 years, until the CPS 2100 and 4100 came out. This soaker has a flexible nozzle selection, although two of the nozzles are near useless. The blaster itself looks like a Max-D 6000, and that is probably because the Max-D 6000 replaced it. This gun isn't all that sturdy, and dropping this blaster is a bad idea. The styling is pretty good, but as with most soakers the coloring is bright, especially the reservoir. The anchored cap is just one of the great features of this blaster. The pressure gauge gets stuck sometimes after a few years of use. The dual pressure chambers are a plus, and it can hold its ground against most other XPs and Max-Ds. An really good user could fight some inexperienced CPS users or even an experienced user with a lower-classed CPS. Overall, this is my most used rifle in a war. Now that they aren't in stores anywhere, they are hard to find, so if you see one, buy it.